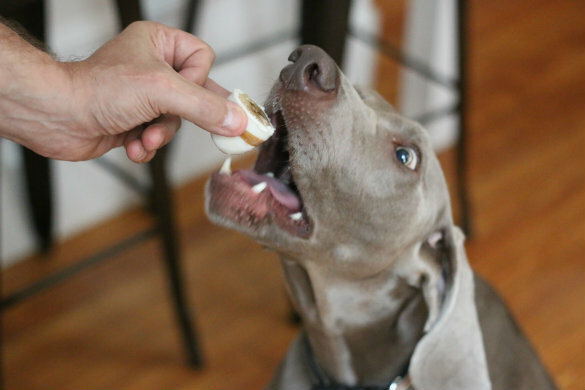 In the summer months (who are we kidding, anytime really), our dog, Basil, loves a food frozen treat. 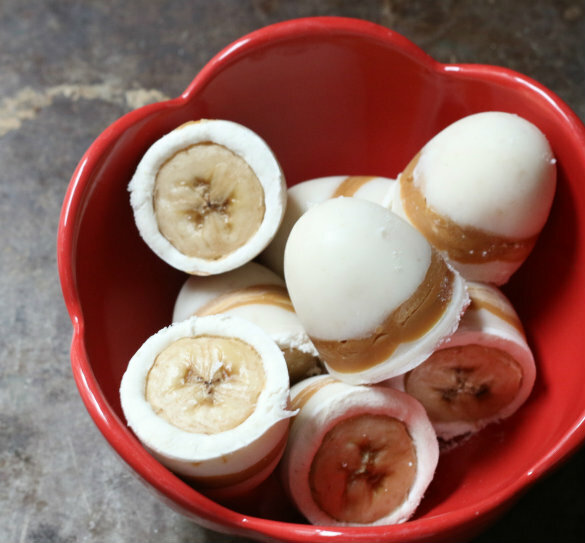 We're big fans of making natural treats from home and today we're sharing our latest creation in hopes your pups might enjoy them as much as Basil does. 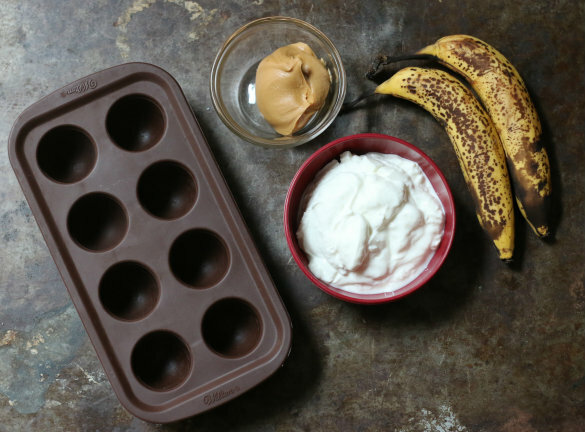 These yogurt, banana and peanut butter smoothie bites make for a natural protein-packed treat your pup will appreciate during the summer heat. 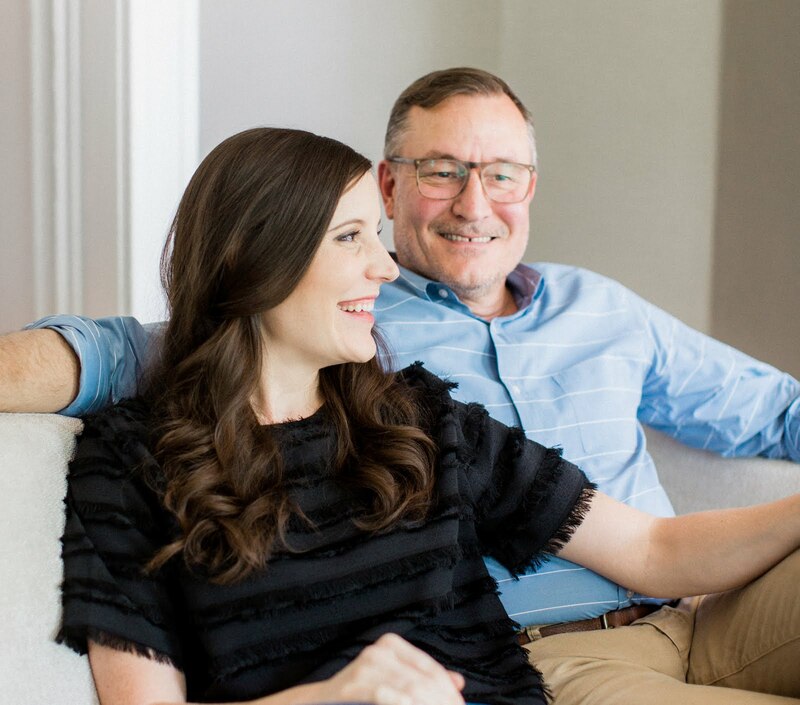 They are made with 3 simple and natural ingredients that are perfectly safe for humans to eat. The key to these treats is in the layering and freezing. 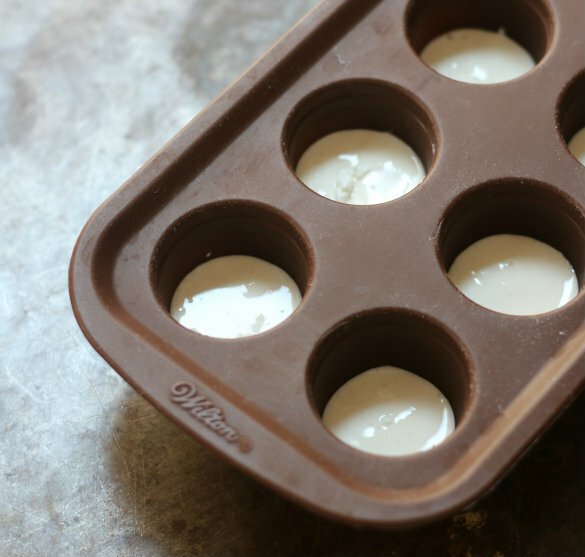 We used a silicone cake pop mold to get the bon bon shape for these bite-sized goodies, but you could use any standard ice tray or mold you have on hand. 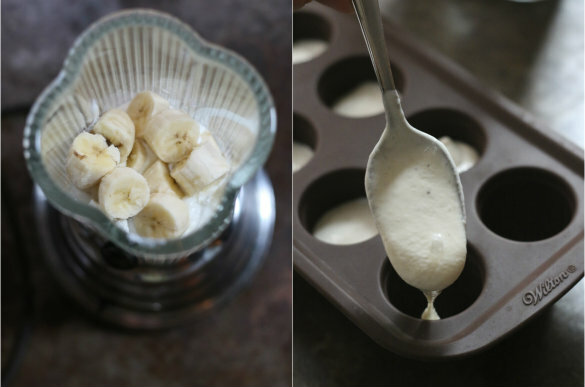 In a blender, combine 1/2 banana with yogurt until it reaches a smoothie like consistency. 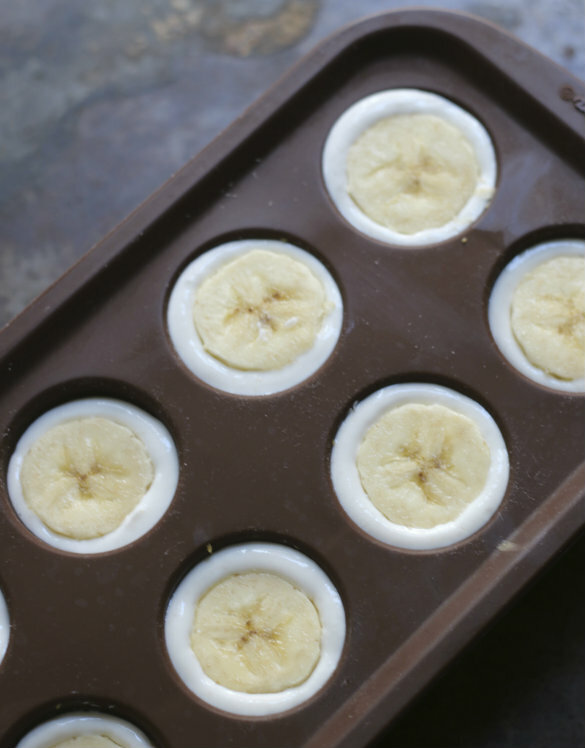 Using a spoon, fill the bottom of the mold with banana/yogurt mixture, leaving room to build up another 2 layers. Give the mold a couple of good "drops" on the counter to level yogurt, then place in the freezer for about 5-10 minutes allowing to chill and set up a little bit before moving on to the next step. 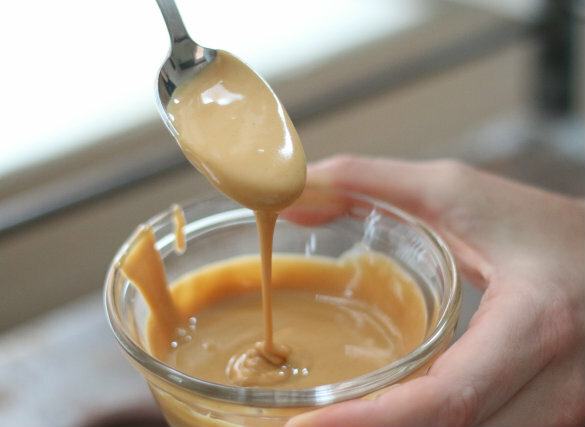 Meanwhile, heat up peanut butter in a microwave safe dish for about 15 seconds to soften, bringing it to more of a liquid-like consistency that's easier to pour. 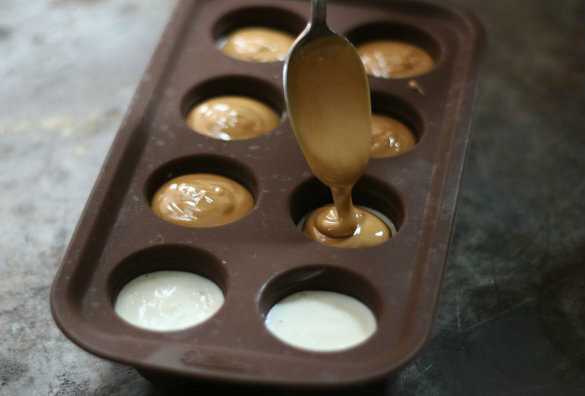 Spoon and drizzle layer of peanut butter over the first layer of chilled yogurt, then return mold to freezer for at least 10 minutes before moving on to the final layer. Once chilled, spoon final layer of banana/yogurt mixture overtop peanut butter and finish by pressing a slice of banana to nestle into the top. Basil was the perfect gentlemen (gentledog?) sitting and waiting to try one of these treats. As with most goodies, he just seems to know when we're making something especially for him. That's our boy! As with most special treats, he rushed into the other room to "have a private moment" devouring this sweet treat. The treats store well in a resealable freezer back for up to 2 weeks (if they last that long). 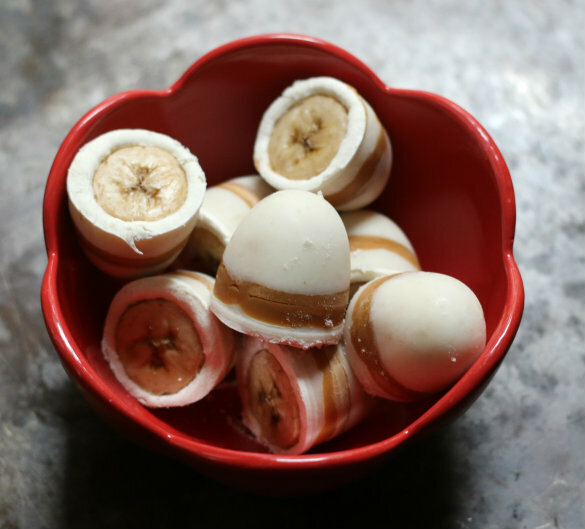 We hope you'll let us know if you give these little smoothie bites a try for your favorite four-legged friends. Please don't forget to let them know Basil says "woof" from our kitchen to yours! 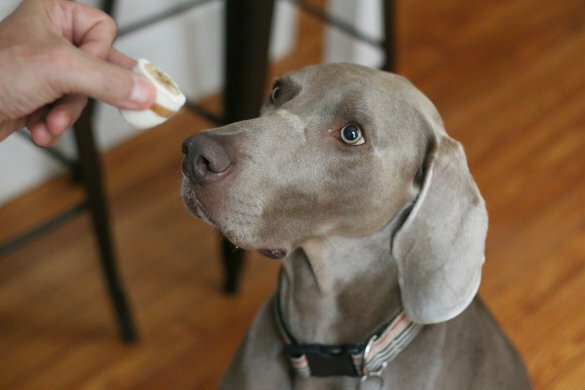 ...and for those of you wondering — yes, these are completely natural frozen bites fit just fine as "human treats" too. Those treats look awesome! 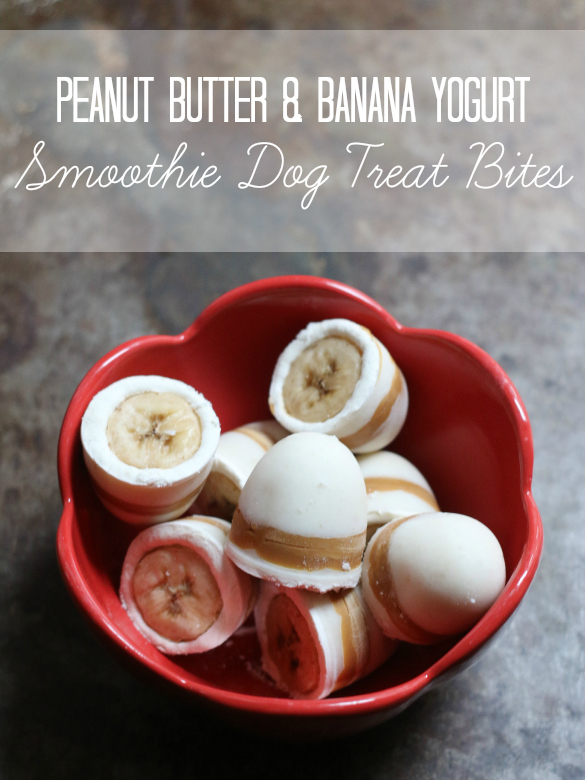 What a fun treat for the dogs and they can share with us too! Great idea!